Torpedo commemorates the actions in World War One of Lieutenant H. Stoker, D.S.O., RX, and the crew of the RAN Submarine H.M.A.S. AE2. 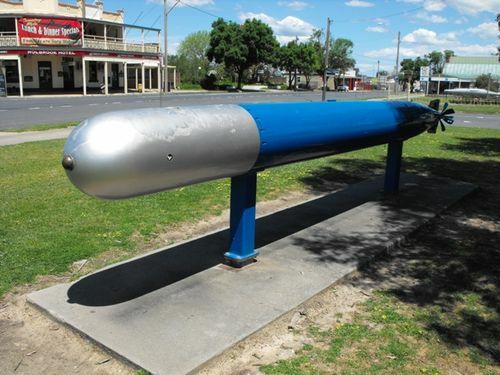 HMAS AE2 (originally known as AE2) was an E class submarine of the Royal Australian Navy. She was commissioned into the RAN at Portsmouth on 28 February 1914 and was scuttled little more than a year later in the Sea of Marmara after being hit by enemy shellfire during the Battle of Gallipoli. The AE2 was the first submarine to penetrate the mined narrows of the Dardanelles and thus to enter the Sea of Marmara. The HMAS AE2 was under the command of Lieutenant Stoker of the Royal Navy who was also a stage and screen actor. After the AE2 was scuttled and her crew captured, Stoker used his acting abilities to entertain fellow prisoners and unsuccessfully tried to escape. BREACHED THE DARDANELLES ON ANZAC DAY 1915. REAR ADMIRAL PETER SINCLAIR A.O.